Without a doubt, two of the most complex and challenging issues of classic stamps are the Large Hermes Heads of Greece and the Colon Issues of Chile. The plates and first issues of each country were produced by the most accomplished engravers and printers in Europe, from Paris and London respectively. The fascination lies in the contrast between the refined European printings and the experimental local efforts to produce satisfactory printings of postage stamps. In the case of Chile, this means Perkins, Bacon of London and N. Desmadryl and H. Gillet locally. Thanks to these two Chilean printers, philatelists can undertake a broad spectrum of study of the first issue: From the line-engraved to the lithographs and back to the line-engraved printings. From the deep dark chocolate to the numerous shades of red and carmine of the 5 centavos. 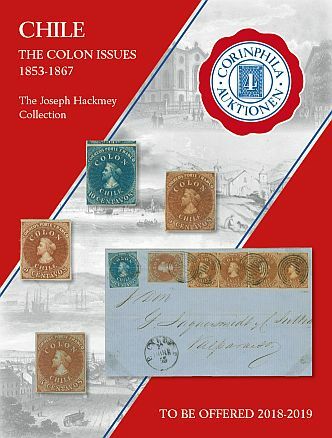 Following from this are the standardised printings by the Post Office, which in actual fact are anything but that, hence the great philatelic depth offered by this classic issue, which had a printing life of fifteen years. Corinphila is pleased to offer one of the most important collections of Classic Chile ever formed, starting with the November/December Sale 2018. Of particular note are the largest multiples both on and off cover for nearly each issue. Aside from the multitude of noteworthy pieces of impeccable provenance, there are many items which are rarities in their own right due to their exceptional quality.